Many of us have photographs we have taken, displayed within frames, in our homes. They may be of people we love, or places we have visited, that we want to be reminded of. One way of adding interest to a photograph is to use another object within the composition of a photograph to frame the main subject. This technique brings depth to the photograph by giving the illusion of more than two dimensions and also serves to focus the viewer’s attention on what the main subject is. The “frame” might be a window, a bridge, an arch, an over-hanging tree or anything else you want it to be. Go ahead – surprise me! 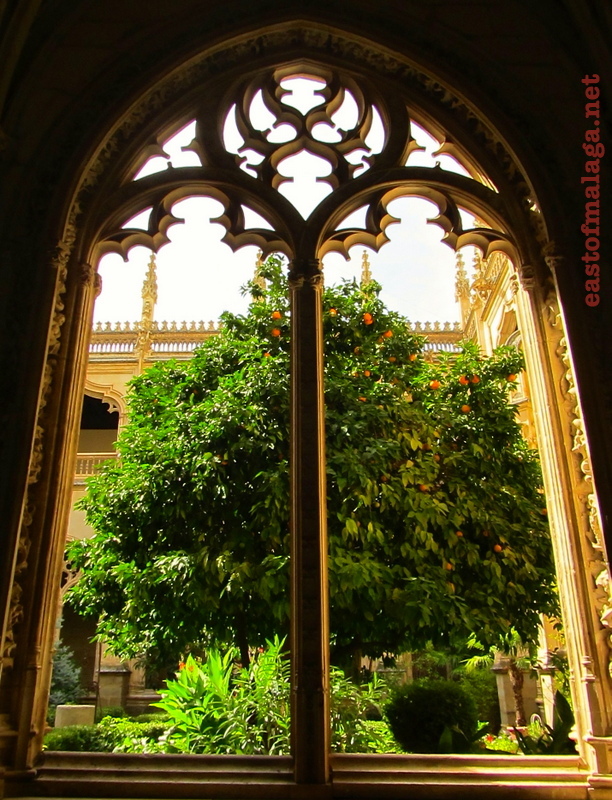 Just look at this magnificent orange tree, framed by the open window frame at one of the many churches in the city of Granada. 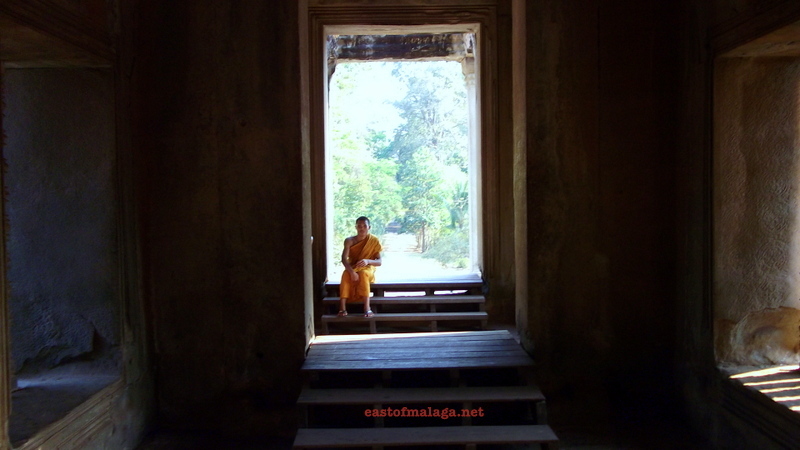 Here you can see a young monk pausing to rest from the heat of the mid-day sun, within the Angkor Wat temple complex at Siem Reap, Cambodia. 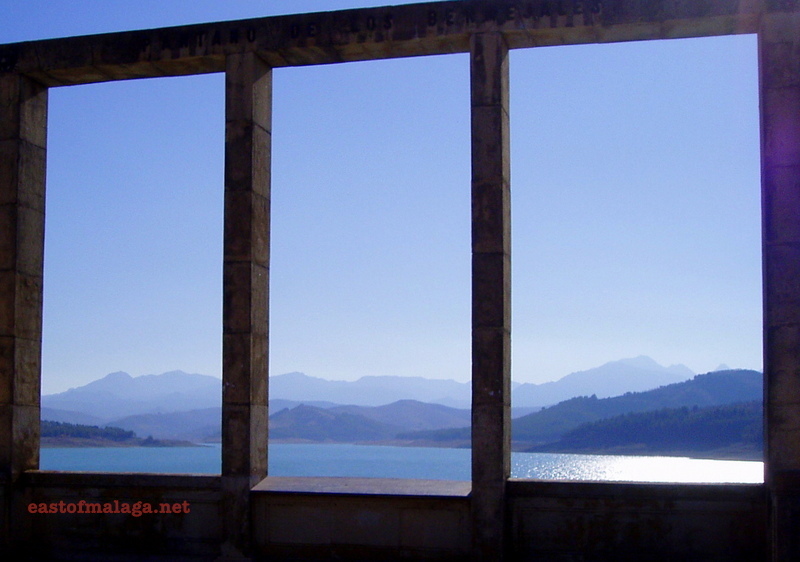 This is the Presa de las Bermejales, a large lake (and a man-made reservoir) situated in the west of Granada Province o­n the northern boundary of the Natural Park of Las Sierras de Tejeda, Almijara y Alhama. This secluded spot, far from the usual tourist trail, is a haven of tranquility especially during the very busy month of August. It´s a beautiful place to spend a peaceful few hours or days, enjoying nature at it´s best. Last year, we took a three month trip around south-east Asia, visiting Malaysia, Thailand, Cambodia and Vietnam. Whilst visiting Ha Noi, the capital of Vietnam, we took an overnight cruise in Ha Long Bay, a UNESCO World Heritage site and voted one of the New 7 Wonders of Nature. There were only six cabins on the boat, and I took this shot soon after morning light, with some of the islands framed by the wooden columns of the boat. I love how the reflections shine and reflect on the polished wood. 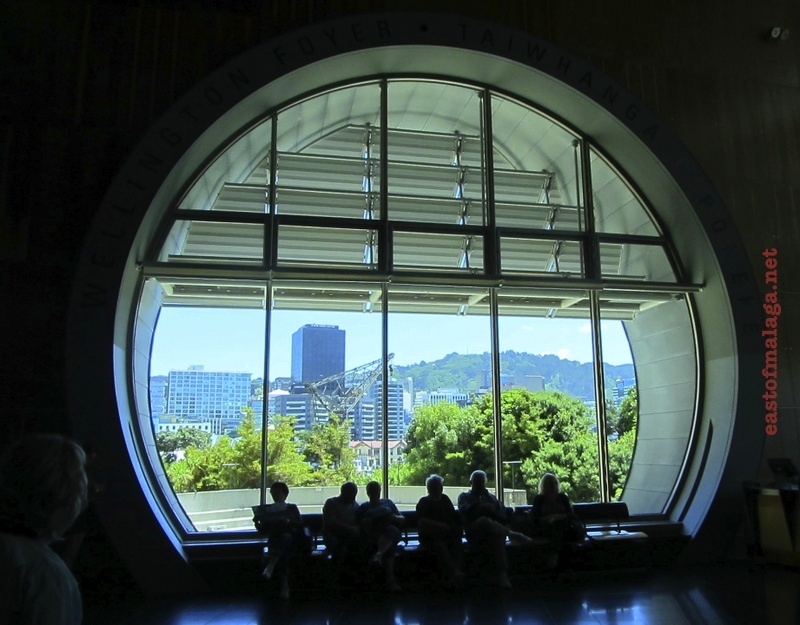 I was struck by the silhouettes of these people, looking out through the huge window near the entrance of the Te Papa National Museum in Wellington, New Zealand. 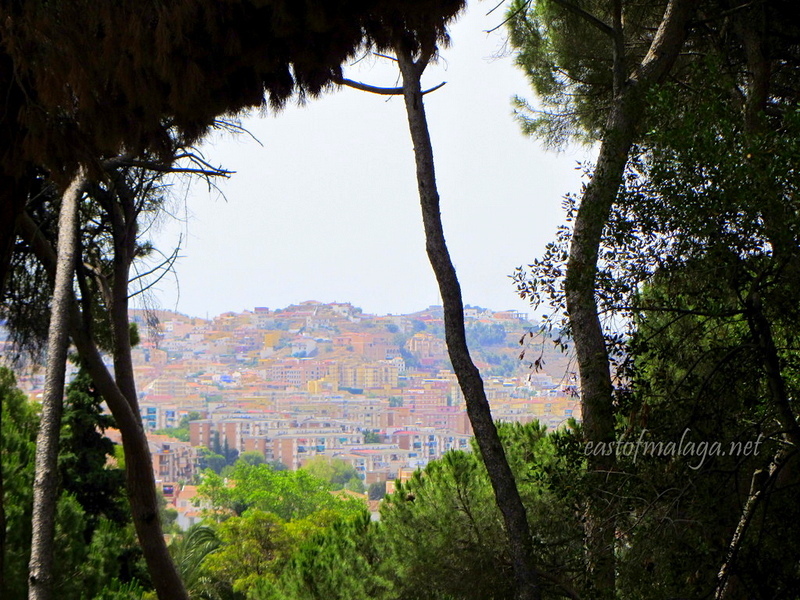 Here you can see the view towards the city of Málaga from the Jardín Concepción Botanical Gardens, framed by trees. I took this photo from inside the cave at Cathedral Cove, Hahei, New Zealand. The tide had turned and was on the way out, meaning we had just time to run through the shallow water to spend a couple of hours in the beautiful bay beyond. 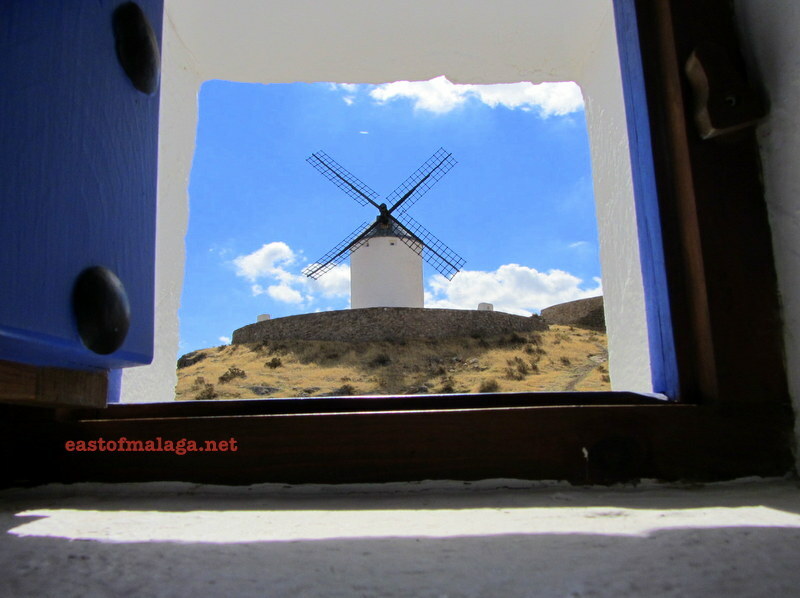 Some of the best examples of restored “Don Quixote” Spanish windmills can be found in Consuegra, not far from Toledo in central Spain, where several mills spike the hill just outside of town. My final image for this month’s challenge is of one of these windmills, taken from an adjacent one, through one of the tiny opening windows near to the roof. ** Staying on the Iberian peninsula, you can find Julie Dawn Fox in Portugal, Spain’s next door neighbour, so to speak. Julie is a talented writer and gives regular updates about her life as an expat in Portugal. I am a huge fan of Julie’s Personal A – Z of Portugal, where she takes each letter of the alphabet and writes a different post using the letter as the basis for a post, about things she feels strongly about in Portugal. This is a very easy blog to read, is very descriptive with many stunning photographs, which always makes me glad that Portugal is an easy drive from my home in southern Spain. ** Richard at The Last song I Heard was one of the first blogs I followed when I set up my East of Málaga blog. I stumbled across his site, where he writes for his son, James, about songs he remembers from his formative years, and it really struck a chord with me. He has a great choice of music and is at present writing a book called The Rivers of Belief. So that´s the CBBH Photo Challenge for March, folks! 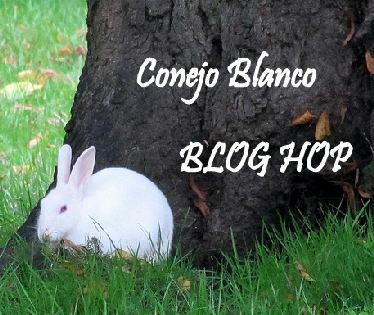 Remember, all you have to do is post your entry by the end of the month, link back to this blog and, most importantly, don´t forget to add links to any two blogs that you´ve commented on during the past month, so that we can all HOP OVER and have a look. Make sure you FOLLOW THIS BLOG so you don´t miss next month´s exciting challenge! You are so talented! I would love to hang the gothic frame in my home! Pingback: CBBH Photo Challenge – Framed | Ouch!! My back hurts!! Wonderful entry for this month’s CBBH Challenge, Paula. I have very fond memories of our visit to Capri about ten years ago – especially on the “ski-lift” type transportation to the top of the island. What fun it was with our legs just skimming over the gardens below! Thanks for sharing links to two blogs you enjoy visiting. It’s always lovely to find new places recommended by friends. Yes, I can imagine you are pretty busy right now. Hope all is going to plan. We are heading back home later today. We’ve been away for four months, and had a fantastic time, but it’s always good to get back to your own bed, isn’t it? Four months? Yes, I’m aware it’s been a wonderful long adventure – I remember sitting at my desk, imagining you heading down to Oz – how can it be four months ago? :). From tidbits like your framed shot from NZ I know you must have thousands of stunning pix – will look forward to seeing them over the next centuries or so. Kidding! You’re right, there’s something about our own beds, isn’t there? And pillow! See ya’ back in Malaga! Great selection of shots, Amy. You’ve really excelled yourself this month 🙂 Well done! Me again, Marianne. Couldn’t resist! Thanks for sharing links to (more than) two bloggers you enjoy visiting. I LOVE visiting new places my friends have recommended! Great entry for this month’s challenge. May I say as usual your photos are amazing!! What a great selection of shots you have for us. My favourite is the Linda Lane beach entrance as I am anticipating seeing the beach where I can go surfing! I loved seeing your world through arches, Margaret. You have some great shots. Thanks for sharing them with us. This was a “ooh, love that one”, “ooh love that one too”, “ooh, love that one even more” series of photos, Marianne. I may try to live up to this. 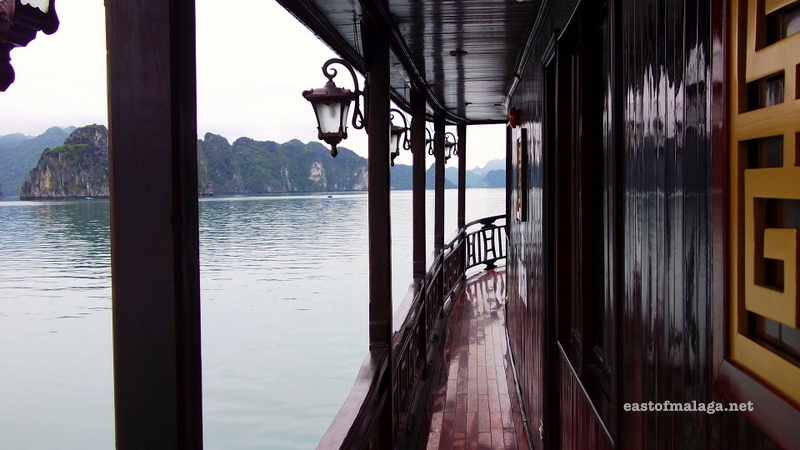 The first shot is, I think?, my favourite but Halong Bay- why haven’t I been there! I had fun choosing my shots for this month’s challenge, Jo. As you may have noticed, I usually manage to sneak in some images other than ones taken east of Malaga, these days. It gives me a bit more scope! Oh yes, you should visit Halong Bay if you get chance. Thanks Marianne – this has been another great photo challenge! Gorgeous shots, every single one of them!! Welcome to the CBBH Photo Challenge! Thanks for including links to two blogs you enjoy visiting. My favourite has to be the first one. The lady looks stunning. I love to use this technique too, Marianne. Thanks for sharing your beautiful shots – my favourite is Cathedral Cove! I love your photos – especially of Elizabeth Castle in Jersey. What fun you must have had with your final shot! Love your new theme Marianne, and you have framed each of these special images beautifully! Think I like the Halong bay shot best of all. Yes, it’s perfect, Madhu, well done! This is two pictures, the first without a frame and the uses an old cinema projector lens hand held infront of the camera. Love them all. Each artistic frame offers a breathtaking view. Just exciting and full of adventures. My favorite would be the cove…obviously I’m drawn to the sea. Have a fun weekend. It was fun shooting them, that’s for sure. Thank you so much for the glowing recommendation, Marianne! I’m blushing and extremely grateful. I’ve been a bit slack on the photo challenge front lately but will do my best to rise to this month’s CBBH. I love your photos – the Halong Bay ones bring back wonderful memories and the windmill is gorgeous! Thanks for sharing links to two blogs you enjoy visiting. I don’t know either of these ladies, so it will be a pleasure to HOP over to them right away. Yes, you’re quite right, Dallas – life IS all about looking beyond – an sometimes putting a frame around it – if it’s special enough. 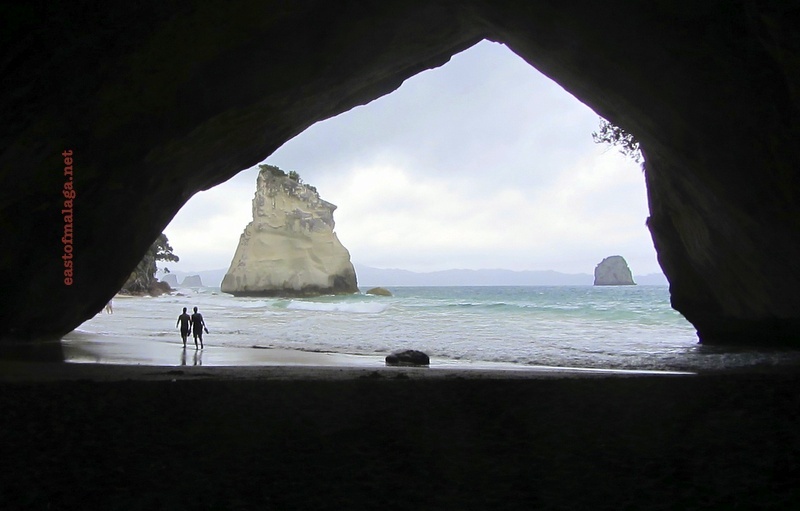 cave at Cathedral Cove, Hahei, New Zealand: wonderful! We really enjoyed our visit to Cathedral Cove. Have you been? But it wasn’t as amazing as Katikati…now was it ??? You’ve stumped me, I can’t choose a favourite from this stunning selection of images, and nor can I offer any of my own but I will be looking out for this type of image opportunity in the feature, after seeing the wonderful results. Glad you enjoyed the photos Ella and thanks for your very kind words. What a lovely thing to say, Sandie. Thank you so much. It’s only over the past year or so that I have really tried to think more about the composition of my shots, and then I have practised and practised. I’ve also tried joining in various photo challenges as it really makes me think about what is pleasing to the eye. I’m sure that once you get your new camera, and you start taking photos with it, you will notice that your photos are getting better and better. Thanks for taking the time to comment, Debbie – much appreciated. Incredible beautiful set of photos. Thanks – much appreciate your comment, Sartenada. What gorgeous photos! I’m inspired to dig out a few of mine now. And I’m looking forward to checking out the blog about Portugal. I love Portugal! Thanks, Sally. Oh yes, you’ll love Julie’s blog 🙂 I love Portugal, too. Beautiful collection, Marianne, along with some very useful information for us novices. From the first to the last photo, you really did frame you subjects wel, creating a very enjoyable post.